BD in vitro diagnostic assays offer efficient alternatives to tedious and operator-dependent manual counting methods for enumerating cells in blood products. 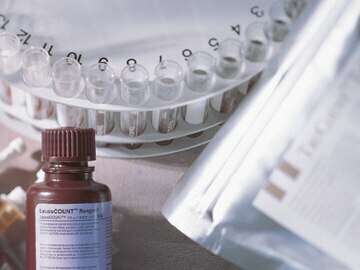 BD Leucocount™, BD™ Stem Cell Enumeration, BD Procount™ Progenitor Cell Enumeration, and BD™ Plasma Count kits eliminate the need for a separate counting standard by combining flow cytometry with the precision of BD Trucount™ absolute enumeration technology, which includes predispensed reference beads that require minimal manipulation. Technology for the precise cell enumeration of blood products. Example BD Leucocount and BD Procount reports.